Every year, Apple and Samsung, two leading smartphone makers, gain pride in their new flagship devices. On the release date, people wait in long lines to be among the first to grab the latest iPhone or Galaxy S model. This has been the case for several years. But this year, sales stalled. With every new flagship phone comes a new, higher price and new innovative features. Bezel-less screens, sharper cameras, more memory, and faster CPUs are just some of the things we see improved with every iteration of a new device. However, most people are starting to ignore these innovations in favor of their old phones or refurbished second-hand phones. Flagship phones can last for several years with the right amount of care and maintenance. Many remain in excellent shape until they reach the end of their lifespan, at which point they are given to refurbishers. During the refurbishment process, the devices are cleaned, and parts such as the screen, protective glass, casing, CPU, camera lenses, and sensors are replaced. The final result is a phone that no different from a brand new product. In the past, most refurbished phones were exported to other countries. They didn’t pose a threat to major phone manufacturers because people were willing to buy the latest phones instead of opting for refurbished versions. However, these refurb phones are making a comeback in US markets, and this is causing a problem for manufacturers. It seems as though faster chips, larger screens, higher display and camera resolutions aren’t enough to convince customers to buy new phones these days. Consumers are starting to see these innovations as good-to-haves, but not necessarily must-haves. Apple even tried to market the “notch” on the iPhone X as a primary reason for buying, but many customers didn’t like it. Samsung chose to focus on the camera improvements on the Galaxy S9. However, most customers were already satisfied with the camera on Galaxy S7 and didn’t see a need to spend money on a new device just because it could take prettier photos. What else might be driving the second-hand phone market? Customers are becoming increasingly aware of the environmental impact of smartphone e-waste. Refurbished phones provide all the functionality of a new device, without having a huge environmental footprint. Fewer phones produced in a year translates to less e-waste in the future. 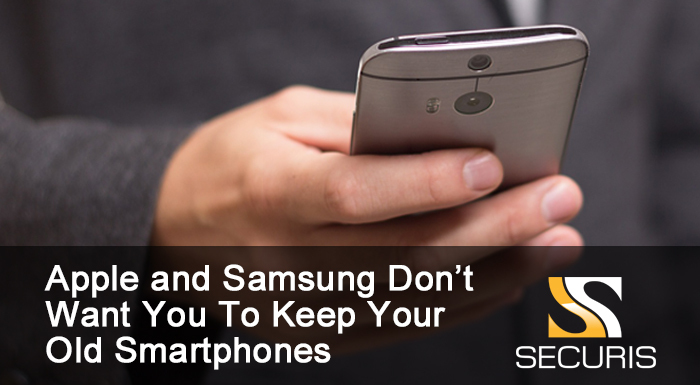 Although refurbished phones have regained popularity in the past few years, there’s still an issue with manufactures disposing their devices improperly. With the right electronics recycling practices, manufacturers gain the ability to recover valuable materials such as aluminum, copper, gold, silver, plastics, and ferrous metals, while limiting their impact on the environment. If you’re a phone manufacturer or refurbisher, you need to work with a certified electronics recycler to dispose of your e-waste. Securis is a renowned IT recycler that can help you get rid of your e-waste safely. We securely destroy any data stored on your hardware using industry best practices and tools. We also have all the required federal and local certifications for electronics recycling. For more information about our e-waste services, contact us here.